It may sound like an odd question, but do you think non-cyclists think of us as a vehicle or pedestrian when we’re on our bikes? I never thought of it coming to these two options before moving to Grenada….a place where cyclists are totally thought of as a pedestrian. A what? How can you possibly think of me as a pedestrian? 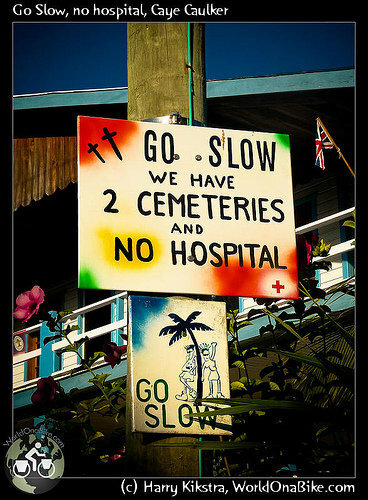 A sad fact, but I see this mentality each and every day from the Grenadian drivers. You see, here and on pretty much any Caribbean island, people walk along the main roads. There is no shoulder and the full road is barely wide enough for two cars to pass, but people walk along the edge with no worries of being hit. It’s pretty trippy at night when you’re driving along and several locals are walking along the edge dressed in dark clothing. Anyway, a typical driver in Grenada thinks of a cyclist as a pedestrian. This means they think the cyclist will behave like someone walking when there is a tight situation and the vehicle wants needs to pass. They also don’t consider you a moving vehicle with the same rights and rules as the other cars on the road. But as you all know, the way someone on a road bike moves and behaves is very different from someone meandering along on a bicycle…..and no matter what type of cycling you’re doing, it’s completely different behavior than a pedestrian. In other parts of the world, it’s probably more of a question of are you a cyclist or a vehicle? We all know what most drivers are thinking, right? Yeah, it’s why those “Cyclists May Use Full Lane” areas are so controversial. In my opinion, we should be considered a bicycle when out on the roads….meaning we are a vehicle that deserves even more precautions than the other cars on the road. Give us 3+ feet. Slow down when passing. Give us a wave and a thank you for being one less car on the road. But most of all…..notice us. Get Bikes on Your Brain. We have every right and absolutely deserve to be out there on the road. Oh, and to anyone from Grenada or other country with the same views on cyclists…..We are most definitely not a pedestrian. Respect us and share our road. 1Love. I agree with you my friend. But you set your self up for the question of, if they (drivers) should consider you a vehicle, then shouldn’t bikers have to obey all of the rules of the road??? I know very few who do. Thanks Eric. Yeah, you’re right. I do feel like we’re much more a vehicle than a pedestrian…..but still in a different class. I don’t want this to sound like I’m favoring bikes, but we should be considered bicycles on the road. Maybe even most similar to motorcycles?